Shakiba Oftadeh Moghadam, a PhD Student at the University of Portsmouth, on rugby players’ mental health literacy. Rugby players are perceived to be ‘mentally tough’, ‘indestructible’, acknowledged for their resilience and hardiness. But what happens when rugby players’ mental health wellbeing starts to deteriorate? Who can they turn to and ask for help? 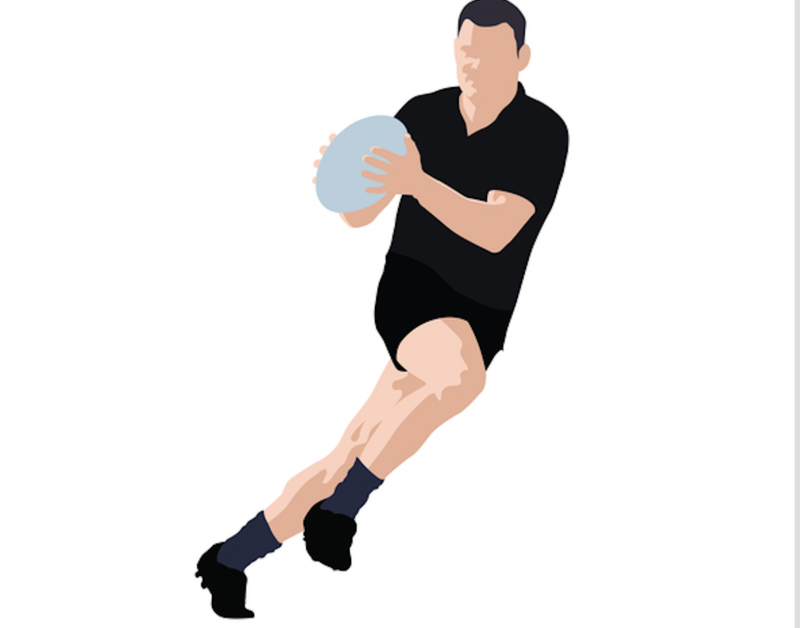 Rugby is perhaps the ultimate contact sport: players fight for possession of the ball whilst running, in scrums and lineouts, placing themselves at high risk injury during training and competitions. Dr Jean-Francois Kaux, a medical doctor from the University of Liege, established that the injury rate in Rugby Union ranges from 30 to 91 or even 120 per 1000 match hours. They revealed most injuries that occur during a match affect the lower limbs, followed by head and upper spinal injuries. It’s no surprise that many rugby players are often forced to retire due to severe, and at times life threatening, injuries. Rugby players are at a high risk of developing symptoms of depression as a result of multiple concussions (Rice et al., 2017). Evidence suggests that athletes with a history of six or more concussions (15 per cent of rugby players) are two to five times more likely to report symptoms of common mental disorders (e.g. depression, general anxiety disorders) (Gottebarge et al., 2017). Additionally, forced retirement, along with retiring from rugby with an increased number of life events (e.g. loss of a family member) and a high level of rugby dissatisfaction, also increases the risk of developing common mental disorders (Brown, Kerkhoffs, Lambert & Gouttebarge, 2017). However, perhaps the root of such problems isn’t the injuries, high rates of concussion or forced retirement. I would argue it stems from players’ reticence to seek support for their mental health. Elite rugby players are under a substantial amount of pressure to perform well, to display a credible, enthusiastic persona for the media and the fans and try remain injury free. Therefore, helping seeking may not be a priority… even worse, it might be seen as a sign of weakness. We know this is an issue in elite sport in general, but for the ‘tough’ persona of your average rugby player it may be even more salient. Thankfully, there is help in sight! Mental health literacy is one strategy that aims to not only improve overall knowledge of mental health, but also help improve attitudes towards care and seeking help. It’s about recognising mental health disorder symptoms, and raising awareness of help-seeking behaviours and knowledge of risk factors and causes of mental health disorders (Jorm et al., 1997). If rugby players or their respective teammates are experiencing symptoms of mental health disorders, they need to know how to gain help and who to gain help from. State of Mind is a well-recognised Rugby Union programme established in 2013 to improve the mental health, wellbeing and working life of Rugby Union players and communities (see stateofmind.org.uk). Dr Phil Cooper MBE, one of its co-founders, has devised and implemented successful training programmes in various areas such as misuse, mental wellbeing and resilience for Rugby League players, students and communities. Moreover, Dr Cooper has delivered player awareness presentations to all Super League clubs, Championship clubs and community-based clubs. His dedicated work has helped players identify how they can improve their mental health wellbeing, encouraged them to seek help if needed and in turn increased players’ mental health literacy. Long-term training programs could also look to increase knowledge of mental disorders, encourage helping behaviours and boost confidence in giving help to others experiencing mental health problems (Kitchener & Jorm, 2006). Rugby coaches have a trusted relationship with the players, so increasing their mental health literacy should also be a priority. Mental wellbeing is influenced by many variables such as socio-economic and cultural background, social interaction, physical activity levels, and diet. Considering the high levels of alcohol consumption within rugby – most commonly post competition – we should inform the players about the social determinants of health and the detrimental effects of elevated alcohol consumption on mental health. The players may then implement small changes within their day-to-day routine. Such workshops should be delivered by credible, professionals such as sport psychologists and welfare officers. With their help, the Rugby Football Union may also provide interactive 24/7 online support and evidence-based advice in relation to how best to manage mental health disorders. I feel that the mental health literacy of rugby players has been somewhat neglected in the world of academia. Consequently, I have embarked on a journey of investigating the mental health literacy of Rugby Union players, coaches and referees as part of my PhD. This will be one of the first projects to aim to ascertain the level of mental health literacy and wellbeing among male Rugby Union players, coaches and referees; and to explore the psycho-social determinants (e.g. cultural background) of and barriers to mental health literacy and wellbeing. Then I will look to evaluate an intervention that is designed to enhance the mental health literacy and wellbeing of male Rugby Union players, coaches, and referees. I hope that as a result of my research, rugby players, coaches and referees gain adequate mental health support. I want players to become aware of their mental wellbeing, and to recognise that voicing their concerns and gaining help is not a sign of weakness. Even tough guys need to care for their own mental health wellbeing. - Shakiba Oftadeh Moghadam is a PhD Student in the Department of Sport and Exercise Sciences at the University of Portsmouth. Brown, J. C., Kerkhoffs, G., Lambert, M. I., & Gouttebarge, V. (2017). Forced retirement from professional rugby union is associated with symptoms of distress. International Journal of Sports Medicine, 38(08), 582-587. Gouttebarge, V., Aoki, H., Lambert, M., Stewart, W., & Kerkhoffs, G. (2017). A history of concussions is associated with symptoms of common mental disorders in former male professional athletes across a range of sports. The Physician and Sports Medicine, 45(4), 443-449. Jorm, A. F., Korten, A. E., Jacomb, P. A., Christensen, H., Rodgers, B., & Pollitt, P. (1997). ‘Mental health literacy. a survey of the public’s ability to recognise mental disorders and their beliefs about the effectiveness of treatment.’ American Psychologist, 166(4), 182-186. Kaux, J. F., Julia, M., Delvaux, F., Croisier, J. L., Forthomme, B., Monnot, D., Chupin, M., Crielaard, J. M., Le Goff. C., Durez., P., Ernst, P., Guns, S., & Laly, A. (2015). Epidemiological review of injuries in rugby union. Sports, 3(1), 21-29. Kitchener, B. A., & Jorm, A. F. (2006). Mental health first aid training: review of evaluation studies. Australian & New Zealand Journal of Psychiatry, 40(1), 6-8. Larkin, D., Levy, A. R., Marchant, D., & Martin, C. R. (2017). When winners need help: Mental health in elite sport. The Psychologist. Rice, S. M., Purcell, R., De Silva, S., Mawren, D., McGorry, P. D., & Parker, A. G. (2016). The mental health of elite athletes: a narrative systematic review. Sports Medicine, 46(9), 1333-1353.